Sri Bhimeswara Temple is the abode of Lord Bhimeswara Swamy(Lord Shiva) and his consort Goddess Manikyamba. 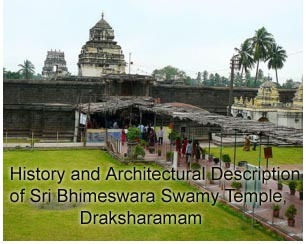 Shri Bhimeswara Swamy Temple is located at Draksharamam, East Godavari District, Andhrapradesh, India. The main deity of the temple is in the form of Linga of 2.6metres height which is said to be of one large Crystal(known as Spatika Linga). The temple is popularly known as Dakshina Kasi Kshetram. Draksharama temple is one the Five Powerful Temples of Lord Shiva known as "Pancharamas" in Andhrapradesh. Sri Bhimeswara Temple, Draksharama, was constructed by Eastern Chalukyan King Bhima in the period 892A.D. to 902A.D. and also consecrated the Shiva Linga and called as Lord Bhimeswara after his own name. Draksharama Temple was developed and patronized by many Royal Dynasties like Eastern Chalukyas, Kalyani Chalukyas, Cholas, Eastern Gangas, Kakatiyas, Reddi Kings and Vijayanagaras as well as some minor dynasties. The Puranas and Contemporary Literature states the Origin and Antiquity of the place. "Skanda Purana" describes the sanctity of Draksharama Temple.The Great Telugu Poet "Srinatha Kavi Sarvabhowmudu" explained the significance of the Temple in his "Bhimeswara Puranam". Draksharama is also referred as Jananathapuram, Pedda Dakaremi, Bhimanathapuram, Dakshapovana and Dakshina Kasi in many Epigraphs. The other shrines in the temple are Brahma, LakshmiNarayana Ganapati, Nakulesvara, Anjaneya, Virupaksha, Nataraja, Kuamara Swamy, Mahisasuramardhini, Saptamatrikas, Bhirava, Viswewwara and Annapurna. To the right side of Bhimeswara Temple Kasi Visweswara Temple(South Facing) is situated. An interesting sculptural panel has the figure of SaptaRishi's and Arundanti. The Seven Sages(SaptaRishi's) are Atri, Bhrigu, Kautsa, Vasistha, Gautama, Kasyapa, Angirasa. This panel is located near the Sapta-Godvari tank of the temple. The main festival of the Bhimeswara temple is Maha Shivaratri Festival. The festival is observed on 28th day of Magha Masam(Febraury/March) every year. On this day thousand of people visit the temple and worship the lord which includes observing Fast and keeping awake(Jagaram) all the night reciting Pamchakshari or reading Shiva Puranas. The important auspicious month is Karthika Masa (October/November). During this month thousands of devotees lighting the lamps in front of Lord Shiva and Goddess Manikyamba. The other imortant festivals are Vaisakha Pournami, Sravana Purnima, Karthika Purnima, Vasantha Panchami, Gowri Vratam and SaranNavaratrulu.